Just read Seth Godin’s post trying to tell someone what something is like. He uses the analogy of trying to describe a spicy pepper to someone that had never experienced the joy (and sometimes pain!) 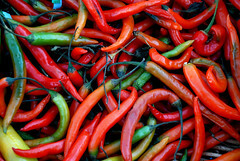 of eating yummy “hot” peppers. Hopefully you know that I’ve been working at developing enough online contacts and social media presence to get folks to “trust me” when I ask that you “just try it” as it comes to Vidli.com’s services. Actually, all you can do right now is to sign up for a beta account when they are ready to start opening up the doors to their business. As a part of their business expansion, they want to hire someone that has proven experience in the world of Social Media Marketing. I’m hoping you’ll help me to be that person. It’s really easy on your part, in fact. All you have to do to help Hire James D Kirk at Vidli.com is click through and sign up. It should only take you about 37 seconds, and it could mean the difference of me getting an interview with the amazing folks at Vidli who help people buy, sell and rent videos online.